Tithe.ly is a dedicated church giving application that is fully integrated with church management functions. 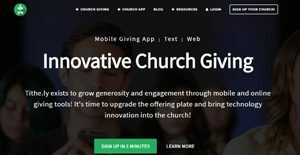 This is an innovative solution that is meant to inspire church members to be more generous and to increase engagement with the use of mobile giving tools. With Tithe.ly, churches and ministries get their own custom church app to upgrade their donation and pledging process. Instead of passing around a basket or envelope, members can give gifts at their convenience through different digital means. Furthermore, Tithe.ly also supports creation of invoices and statement accounts for ministers and their churches to be upfront and transparent to their congregation when it comes to finances. No more baskets, no more envelopes, no more checks. With Tithe.ly, churches and ministries can level up their gift giving processes by accommodating digital donations and pledges. The solution provides five ways of doing so: mobile giving through a custom-made church app, giving through texts, online portal, kiosk giving, and admin entry for large amounts. Individuals can choose which one is more convenient for them and they can even schedule recurring donations. For those who do not wish to make an account or to download an application, Tithe.ly also supports one-time and anonymous transactions. Due to the convenience of digital giving, individuals can be spurred to increase the frequency of their giving. Ministries and churches that are using the application note a surge in the online giving of their members, mainly because of features such as recurring and scheduled giving. After each giving process, donors and pledges automatically receive email confirmations that their card has been charged for the gift. On top of that, they also get a digital invoice showing the amount they gave and to which fund they directed it to. Furthermore, Tithe.ly also allows donors to keep track of their gift giving. They can access their giving history and see how much they have donated to their church or ministry since they began using the app. This affords transparency to the minister and to his ministry and also makes accounting more efficient. Tithe.ly supports system login using online banking credentials. This eliminates the use of account and routing numbers and makes the donation process easier for users while assuring users that their financial details are secure as the platform itself is highly protected. If you are considering Tithe.ly it might also be a good idea to check out other subcategories of Best Church Management Software gathered in our database of B2B software reviews. There are popular and widely used solutions in each software category. But are they essentially the best fit for your organization’s special wants? A trendy software solution may have thousands of subscribers, but does it present what you require? For this reason, do not blindly spend on popular systems. Read at least a few Tithe.ly reviews and think about the elements that you desire in the software such as the cost, main functionality, available integrations etc. Then, shortlist a few apps that fit your requirements. Check out the free trials of these products, read online comments, get information from the vendor, and do your homework thoroughly. This in-depth homework is sure to aid you select the most excellent software application for your company’s special needs. How Much Does Tithe.ly Cost? We realize that when you make a decision to buy Church Management Software it’s important not only to see how experts evaluate it in their reviews, but also to find out if the real people and companies that buy it are actually satisfied with the product. That’s why we’ve created our behavior-based Customer Satisfaction Algorithm™ that gathers customer reviews, comments and Tithe.ly reviews across a wide range of social media sites. The data is then presented in an easy to digest form showing how many people had positive and negative experience with Tithe.ly. With that information at hand you should be equipped to make an informed buying decision that you won’t regret. Amazing solution for ANY size Church or Ministry! What are Tithe.ly pricing details? What integrations are available for Tithe.ly? If you need more information about Tithe.ly or you simply have a question let us know what you need and we’ll forward your request directly to the vendor.